If I were to make my new year’s resolutions before the start of January, they would be very rushed and badly considered. The first week of January for me is still grasping on to the remnants of Christmas, holding on to the tree and the magic for as long as possible. When I have finally accepted that it’s the new year, I need to ease myself into it, looking for authentic inspiration that will guide me through. I love the Japanese way of going to a temple on new year’s day, and since having the bubba, this seems like a logical way to focus the energy of the new year. I am not even envious of those of you partying through the night (well, maybe only for a second or two) – I always found new year parties a bit too pressured to have proper fun. This year, on the 1st of January, we went to Battersea Park to meet my partner’s family at the peace pagoda (a lovely place to calm the mind and set some intentions for the coming year). The toddlers has great fun getting soaked jumping in muddy puddles (I blame Peppa Pig). A couple of days later I took part in a kundalini workshop, which was all about being kind to oneself. My new year’s resolutions will stem from this basic starting point. I trust that my resolutions will make themselves known to me in the coming weeks and I hope that they will help me achieve everything I wish to achieve this year, yet I will not put any pressure on myself to achieve anything at all. I will allow this year to unfold naturally, without any pressure. In fact, this will be my resolution number 1. I have spent too much of my life pressuring myself, then being overwhelmed when the results all come at once. Another resolution appeared to me yesterday in this article in The Guardian, written by a Buddhist monk. I was immediately inspired by it because it rings so true – feeling that your environment is clean and organised gives you peace of mind. My environment is not that clean or organised. I am getting better at it, but the enormous pressure my mother put on me to clean in childhood made me want to rebel against it for a long time (which leads me nicely into the following resolution), but I will clean a little bit every day. Not in a rushed/annoyed /hassled kind of way, but consciously, as a meditation. 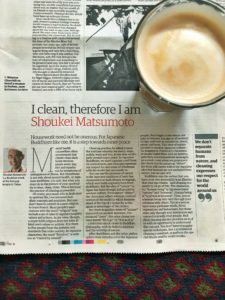 Mr. Matsumoto makes the point that to have a cleaner is a bit like outsourcing your meditation practise, yet having not had out cleaner for two weeks has highlighted how much we depend on her, so I am not going to go mad with this cleaning business (I have to be kind to myself, remember? ), but I will introduce a “cleaning practise” into my daily life. I have also found inspiration for my new year resolutions in this book I received as a Christmas present. Perhaps another resolution could be to take care of my fingernails better… but focus on the book please. We are reading this together and it’s revolutionising our parenting. New Year’s resolutions number 3 will be to be a more aware, less reactive parent. When we react, it is usually a result of our past conditioning. It’s far better to breathe and stay still for a moment when we feel triggered in some way. Bringing up a toddler is both wonderful and extremely challenging and being triggered is actually a good thing because it means that we are given the opportunity to grow and develop. The problem is when we don’t look inward and react outwardly instead. 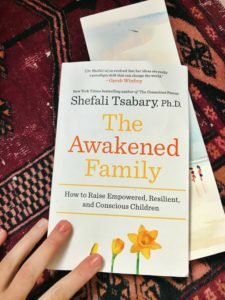 The main theme in “The Awakened Family” as far as I can see is that our children are here to help us evolve, an idea I am totally in agreement with, yet before now didn’t really know how to put into practise. As well as these personal resolutions and plans, I have some career goals, which are not entirely in my control. It is hard to make resolutions about things like that, because there is an element of letting go that has to take place, of allowing things to fall into place at the right time, with the right people and the right ideas. Because of this, I can’t really talk about these exciting career goals much for now. I can tell you that there are three of them and one of them involves writing, another one TV and the third one… feeding people. All the things I love. If even one of these goals takes places this year I will be deeply satisfied; if two out of three happened I would be extremely happy; and if all three did then I would be over the moon with ecstasy. Yet I plan to be happy regardless. Perhaps all three is unrealistic – who was is that said that we overestimate what we can do in one year and underestimate what we can do in ten? My friend Simone said this to me last week over a tasty kimchi bibimbap, but she was quoting some famous businessman or something. So my resolution is to work calmly and resolutely towards these amazing goals, yet to let go of trying to control them, because actually I can’t. Have an amazing 2018! I can feel that this is going to be a good year.